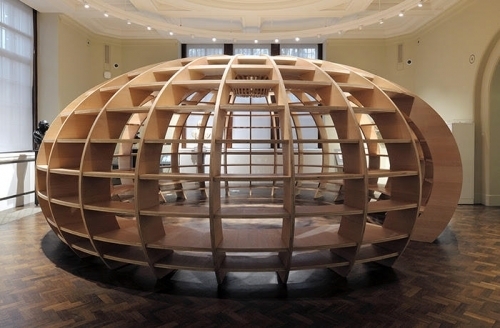 Sean Kelly is delighted to announce that Los Carpinteros' specially commissioned permanent installation, The Globe, will be on view as a centerpiece of the Victoria and Albert Museum's new Europe 1600-1815 Galleries, opening to the public Wednesday, December 9, 2015. Charged by the museum with devising a large-scale, imaginative and thought-provoking piece that would sit within the gallery examining the Enlightenment, Los Carpinteros proposed The Globe. It is a curved architectural sculpture made from a lattice of engineered beech and it forms a permanent ‘room within a room’ at the heart of the new Europe displays. Seating up to 30 people, The Globe will be used as a space for events, discussions, and salons. Occupying a pivotal space – both architecturally and in terms of the narrative of the galleries – it offers visitors an opportunity to pause and reflect, as well as encourages engagement with the concept of the Enlightenment. To find out more information about The Globe and the Victoria and Albert Museum's new Europe Galleries, please visit vam.ac.uk. To watch an interview with Los Carpinteros about the creation of The Globe, please visit vimeo.com.